Sweet potato recipes from family, friends and my favorite recipe resources. So, you've heard about the sweet potato! That's why you're here, right?... Looking for a variety of recipes to get this "super food" into your diet more often. No more looking through stacks of recipe books or searching the recipe sites for ways to creatively cook those sweet potatoes. I've packed this resource with my favorite traditional, and not so traditional, recipes for your easy reference. Let me tell you how I got started on this sweet potato mission. A few years ago, my Dad (a true farmer at heart) included sweet potatoes in his garden. One day a bushel of sweet potatoes showed up on my doorstep. Well, this was a first for me... A bushel of sweet potatoes on my doorstep. Imagine my surprise! I have to confess that we rarely included them in our diet, except for the traditional Thanksgiving and Christmas Holiday recipes. So, I had to get busy figuring out how I was gonna' use all of those sweet potatoes. My Dad works hard in his garden... I couldn't let them go to waste. I was determined to work them into our diet at least three times a week, until I had exhausted the supply. While I was researching, looking for new ways to cook them, I got an excellent education on just how great this "wonder food" really is. They are packed with vitamins, antioxidants, and fiber. It's even been noted that they may help prevent or cure some ailments and diseases, including Cancer. There are more than one variety of sweet potatoes. The most familiar variety is the dark skinned, orange flesh, rather sweet version. However, the other variety is more dry with a yellowish or white flesh and only slightly sweet. You should look for sweet potatoes that feel heavy for their size. They should be free of bruising or soft spots and have no sprouting occurring. Do NOT refrigerate. You can store them in a cool, dark place. You can cook sweet potatoes using the same variety of cooking techniques that are used for the traditional white potato. You'll find a variety of recipes here using a variety of cooking methods. Let our many delicious recipes help bring this wonderful super food to your table! 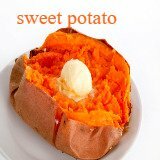 I'm determined to build the largest selection of Sweet Potato Recipes available in one location! If you have a favorite family recipe (or cookbook recipe) I would really appreciate you adding to the recipe collection by sharing your favorite recipe with me and other visitors to the site. You can submit your favorite Sweet Potato Recipe, too!